Addis Ababa is a huge and confusing city and, to a new arrival, it can seem overwhelming and inaccessible. It’s sprawling, busy, and chaotic but it has a charm to it that I love and it invites me to try to uncover its mysteries. One of my favourite things to do in Addis is just to walk around, explore, and see what I see. True, I’m making a map of the city so that’s kind of a part of my job, but work aside, wandering Addis’ streets, observing the hustle bustle, and seeking out restaurants and cafes that I’ve never been to before is fun for me. So, with this in mind, I was pretty pumped to discover Addis Eats. This small company started a few years ago giving food tours around the city and they’ve since grown to include market and city tours along with custom tours out of town. 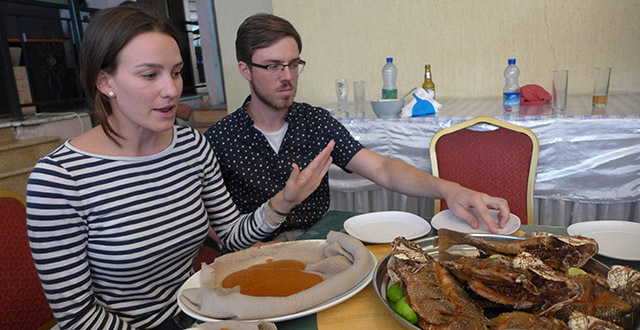 Addis Eats was started by Eliza and Xavi, Americans with a love of Ethiopia. Eliza grew up in Washington DC but has a special connection Ethiopia, having grown up with an Ethiopian nanny since she was two months old. Since her early days she’s been listening to Amharic, has been in a house full of Ethiopian friends, has driven with Ethiopian music blasting in the car, and most importantly for their current business, she’s been eating Ethiopian food for a long, long time. She’s taken all of this an forged it into a pretty great little business and I was super excited to try their food tour. Our tour happened to be led by the Addis Eats founders themselves, but their company employs several Ethiopian guides who get amazing reviews as well. I was impressed with Eliza and Xavi from the start. They’ve got an excellent rapport with everyone they come in contact with and a real understanding of life in Ethiopia and the ability to explain things to us confused new arrivals. They’re patient with questions and thorough with their descriptions and explanations of everything, leaving us tour-takers feeling quite informed. 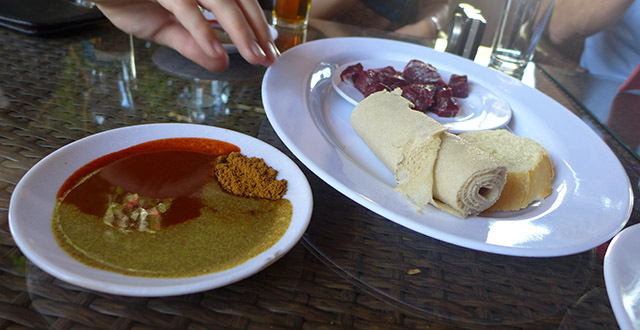 This personal connection to Ethiopia, her and her partner’s skills with Amharic, and their love of great food makes them a pretty great team to run an Addis Ababa food tour. Our afternoon eating frenzy started at O’Canada, a popular bar in the Chechnya area of Addis that taxi drivers know, making it a good meeting point. After a coffee and a quick orientation and explanation of our stops, we hit the road towards our first destination – a popular local restaurant known for it’s shiro. Not being all that familiar with what shiro actually is, the Addis Eats folks gave a good explanation. We also got a nice history of the restaurant along with a useful demonstration on how best to eat injira. Sadly for me, I still had a nice selection of reds and yellows on my pants before the trip was done. The atmosphere in the first restaurant was great, the food even better, and on top of all of that, we got to sample a few of Ethiopia’s beers. We wandered on from there stopping at a cool tea and oils shop before meandering through an interesting old neighbourhood. We saw some berbere drying out in the streets and were treated to some more anecdotes on life in Addis as we walked. Our next stop was a meat house with some of the most amazing beef I’ve ever had. It better be good – that’s all they serve! I even tried it raw in all of its chewy, meaty, glory. I only had one piece of the raw stuff before switching back to something more familiar, but I was happy to have had the opportunity to give it a try. We dabbed our meat in some great sauces and washed it all down with ‘turbo’ before continuing on our way. Next up was fish. While Ethiopia seems to be all about meat, somehow fish has become an acceptable meal during the fasting times – which we learned all about. 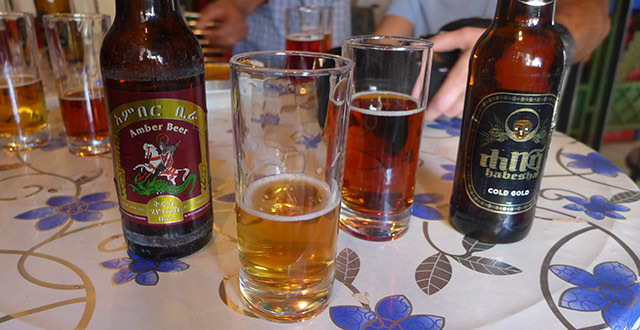 We were presented with a plate of fried fish, given some background on where the main fishing areas of the country area, and washed it all down with some more beers before moving next door to a local coffee house. 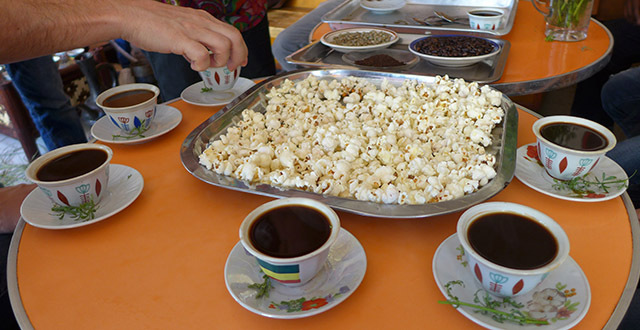 We got a bit of a crash course on the history of coffee, the Ethiopian love affair with the drink, and their care in preparing it in their own homes as part of coffee ceremonies. We also learned that these small coffee houses that are scattered all over the city attempt to combine the atmosphere and great coffee into a shorter experience and had some amazing coffee at what is essentially a local neighbourhood cafe. Plus, there’s popcorn! Moving on and feeling nicely full, slightly boozed, and enjoying good conversation, we wandered just a bit down the street to a juice place. Juice in Ethiopia seems to be a ‘thing’. There are fruit stalls all over the place and most will whip up a delicious, fresh juice from within their small shops. We parked ourselves in a nice outdoor seating space and waited for the for our ‘esprice’, a mix of the day’s fresh juice. Sometimes these are served in layers but today our 5 or 6 juices were mixed into a delicious orange medley of fantastic fruitiness. It was a perfect end to a wonderful afternoon of eating and drinking new things in exciting and interesting places I never would have found on my own. 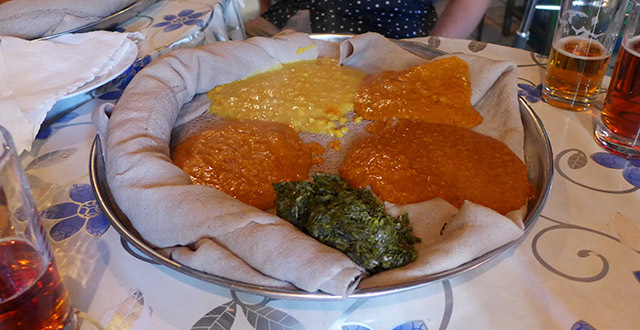 The Addis Eats’ tour I was on is their food culinary tour for a very reasonable $60. The tour runs for 3 to 4 hours, explores an awesome part of the city, and includes food at three restaurants with unlimited beers, soft drinks, and coffee. Minimum group size is two people and the maximum is 12, but if there are more then 8 there’s an extra guide. You can join them for a lunch tour starting at 11:30am or the dinner tour from 4pm but they’re pretty flexible and generally willing to tweak the time if necessary. 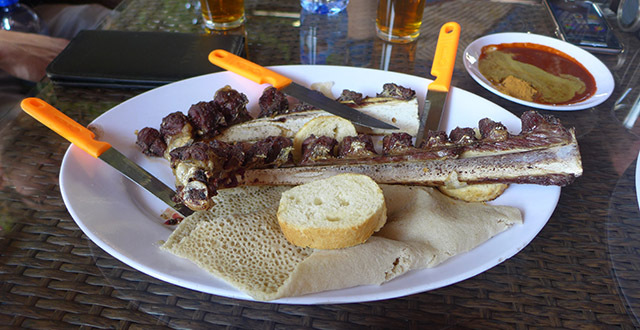 Check out their Addis Eats website for a list of all of the tours they have on offer. It really was a great afternoon of eating, drinking, nice people, interesting places, and good conversation. I think this sort of a thing is perfect both for tourists with a limited amount of time but also for new arrivals who might be moving to Addis for the longer term. 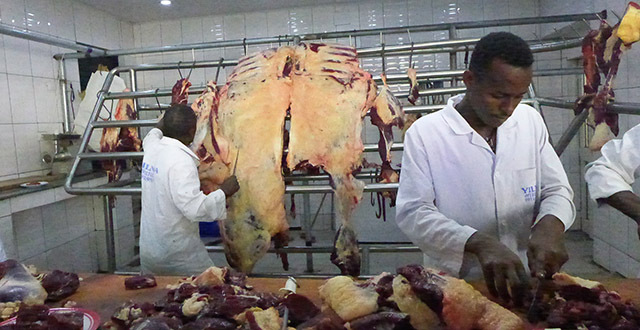 I mean, you can get the lowdown on an awesome shiro place, great meat, and a fantastic place for fish to keep visiting over and over during your stay in Addis. Plus you’ll get a useful bit of background to the city and the customs of Ethiopia. It’s a great introduction to a really interesting and exciting place and you’ll be happy you let the folks at Addis Eats lead you around. If I haven’t convinced you, check out their reviews on Trip Advisor. They’re the number one option for things to do in Addis and they deserve every great review they’ve gotten so far!